Brilliant report, thanks so much for sharing. Glad you had more highs than lows. Great food report. Thanks for taking the time to do it live. Your pugs are so cute. Loads of highs in terms of food, not too many lows but considering where you are there should not be many lows especially the ones caused by bad service like the flying fish. Great report, thanks so much for sharing. Love the pugs! 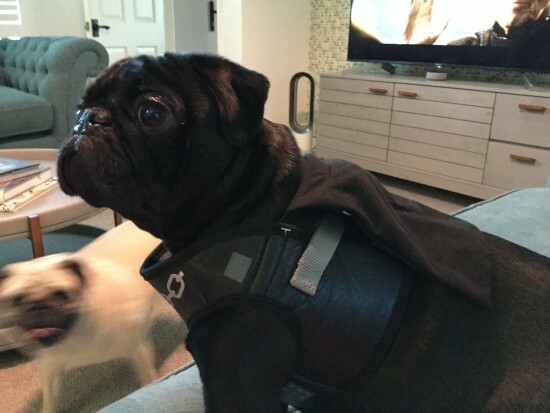 One more pug pic just for you, the Darth Vadar harness has a cloak. Alfie (the fawn) has taken R2D2 harness off as it was a bit too small for him. Just read your enjoyed food report on the way home from work tonight & really enjoyed it. You’ve really put so many ideas in my head & I thought I had moved away from a few restaurants that are now possibly contenders. I’m disappointed for you that you had such bad service on occasion but plenty of good steak and lobster to help balance it out. Loved your report. Thank you and your dogs are so beautiful! Great report ! Thank you so much for posting, the Yachtsman is a definate for us now ! July 1997 - Quality Inn Plaza,I Drive.